« Holy @#$%!!! Thanksgiving Is Next Week! 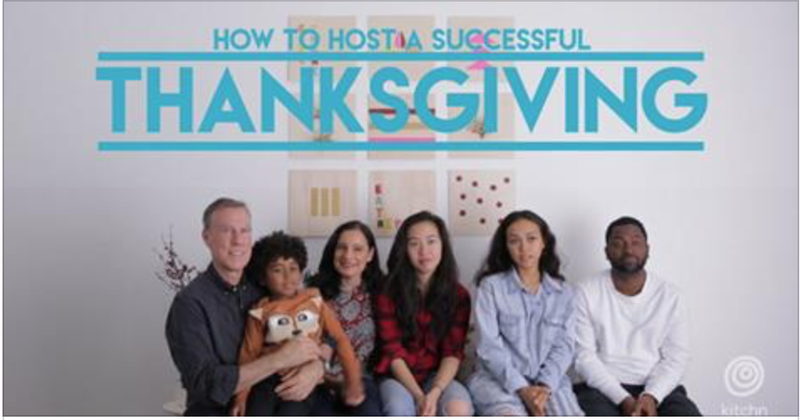 When one of my favorite websites, The Kitchn, invited me to participate in their Thanksgiving video series, I jumped at the opportunity. But the real magic happened when my family wandered in, and reluctantly joined in on the fun. While the content is as promised, what puts a smile on my face is seeing my family together as we really are; raw, authentic and very happy. In a time when many are feeling isolated, disenfranchised and afraid, looking at my multi-cultural and multi-racial family, gives me great joy, and for that I am thankful. This Thanksgiving, do not let fear or hatred cloud your thoughts. Family isn’t just about gene pools; it’s about love. I hope you can feel ours in this video. *Sorry, I can’t get the video to embed. Please click on the link to view. Thank you Rebecca and team at The Kitchn + Apartment Therapy for letting us be part of your series. This entry was posted on November 21, 2016 at 7:30 am and is filed under family, Food. You can follow any responses to this entry through the RSS 2.0 feed. You can leave a response, or trackback from your own site.